A file photo of a Canada Post truck. Canada Post needs to get customers their parcel on time but not at the expense of worker safety. The dispute between the Canadian Union of Postal Workers (CUPW) and Canada Post is based on a lack of worker safety. Workers also feel overwhelmed with their workload. While it may be inconvenient to not receive mail when it’s supposed to come, it’s clear that a postal worker’s well-being is more important than bills and material possessions. CUPW president Stephen Williams said in a Chronicle report that a common problem for postal workers is being “overburdened” with work. 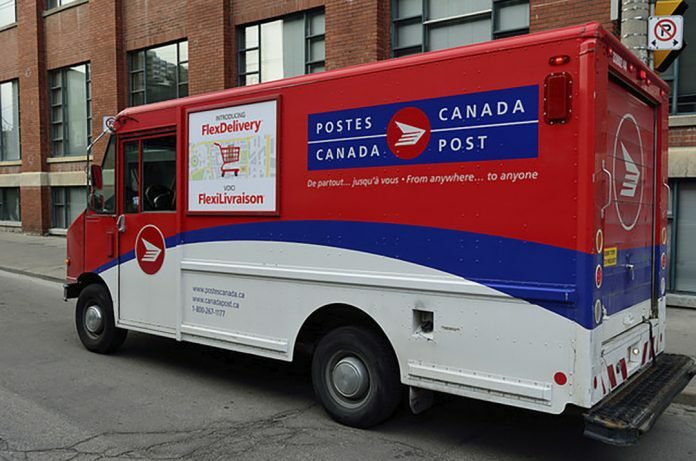 One thing on the rise is e-commerce and online shopping, and while the CUPW did not highlight online shopping as a factor for the strike, the number of parcels coming in from these websites could be to blame for the sheer quantity of work a postal worker faces. According to Statista, 10 per cent of Canadians made an online purchase once a week in 2016. While some may not see 10 per cent as very large, with a population of more than 36 million people, that’s approximately 3,600,000 parcels shipping across the country every week. With numbers that high, it’s no wonder CUPW wants Canada Post to become aware of the issue of overburdening their workers. Another big concern raised by the CUPW is worker safety. According to Williams, in the same Chronicle report, the Oshawa and Bowmanville areas have a staggeringly high number of injuries on the job. People expect to leave work the same way they came in, more or less unharmed. So putting mail before worker safety is a completely legitimate reason for a delay in mail traffic. Some may say some jobs come with risks but most jobs other than police work have safety policies in place to avoid workplace injuries. If the CUPW believes Canada Post’s plan isn’t up-to-date, then Canada Post should take a better look at it and people should be more concerned about the people who deliver their mail. According to the Occupational Health and Safety in Ontario annual report from the Ontario Ministry of Labour, there were 208 workplace fatalities in the 2016-17 year. That’s 208 people who didn’t make it home from work due to an accident in the workplace. If taking it slow is something that will make a postal worker’s job safer, everyone should take a little time to slow down. As the rotational strike sweeps the country, the CUPW and Canada Post’s Twitter is filled with angry people complaining about missing and delayed packages. While inconvenient, shouldn’t people be more concerned with how the strike is proceeding? The CUPW has been helpful with keeping up with strike updates on Twitter but not much has been shared about how negotiations are going. People are more concerned about the present than they are about the future, a future that depends on how well this strike goes for the union. With the holiday rush happening soon and everyone trying to ship packages to their families, let’s hope this strike is resolved not only quickly but in a way that our country’s postal workers can be ensured they get to see their families.